I’m in a familiar place, high up on the Pali, raindrops splattering on the dirt next to me, traffic noises just barely audible from below between the gusts of wind buffeting the ridgeline. A new sound fills my ears as 808 Cleanups Executive Director Michael Loftin triggers a cordless drill with a wire wheel attached to the bit and gently leans into the rock face next to the popular Pali Puku. Grit flies, driven away from the rock by the metal bristles and specks of paint, until recently forming unsightly graffiti covering the rock next to the puka, float away on the wind. 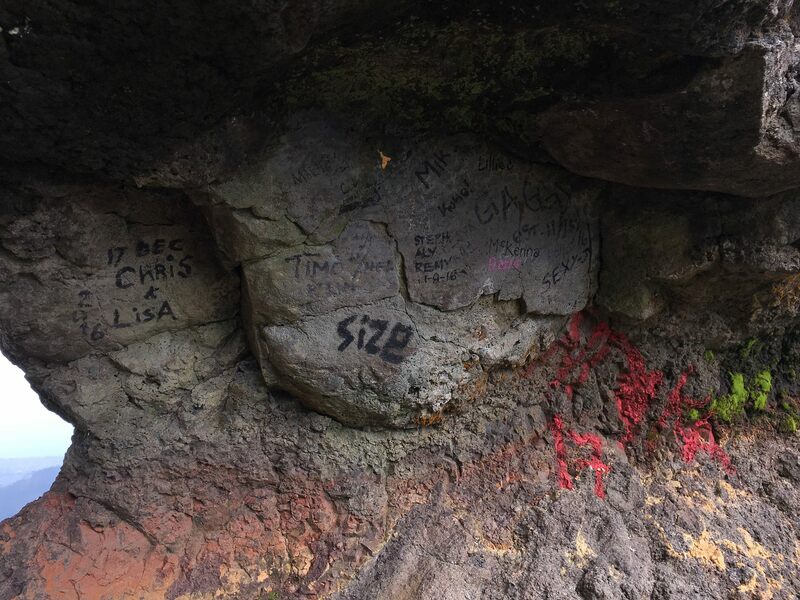 A too frequent occurrence; graffiti on the rocks at the Pali Puka. This is the third time now Michael and I have made the trek up here, alerted by what we’ve seen in posts on social media—Instagram and 808 Cleanups own Facebook group seem to be the best early warning system—that somebody has splashed a painted or magic marker version of their tag or initials or some other form of gibberish on the rocks. The Pali Puka is hardly the only place this occurs. 808 Cleanups volunteers have made regular trips to Pele’s Chair, “Pride Rock” in Lanikai, Kapena Falls and other locations to safely remove graffiti left by people have failed to care for our ʻāina at a most basic level. And it’s not just graffiti. Repeat dumping just feet from the front gate of the transfer station on Kapa’a Quarry Road have brought out volunteers every few months to pick up the mess. 808 Cleanups volunteers hold regular cleanups at Nimitz beach near Kalaeloa Airport, leaving it looking pristine, only to arrive the next time to find it trashed again. One of our biggest ongoing projects is the almost weekly removal of pallet bonfire remains from the Ka’iwi coastline, where over the past two years volunteers have removed over 24,000 pounds of nails and staples left in the sand! One long time volunteer has a standing appointment at a specific city park to pick up the trash left by families “enjoying” the park every weekend. 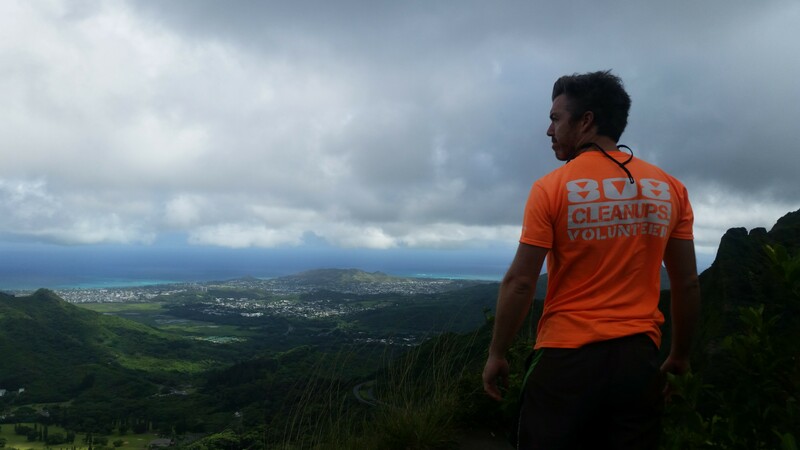 808 Cleanups Executive Director Michael Loftin enjoys the view after removing graffiti from near the Pali Puka. So why do so many of our amazing volunteers keep coming back to sites that they’ve already spent hours of their valuable time cleaning up, only to see their efforts undone again and again? It’s because they care. It’s because they know if they don’t do it, nobody will. They do it to educate future generations. They do it because they are motivated by others they see posting on the 808 Cleanups Facebook group. They do it because they are demoralized by the images of tagged rocks and burning beach bonfires they see in their Instagram feed. But most of all they do it because they know it’s the right thing to do. Back up on the Pali, Michael turns off the drill and brushes paint flecks away from the rock face. We step back and admire the view through the puka, now free of graffiti. We’ll probably be back again, but that’s ok, because today, we’ve made a difference. Top Photo: Kailua as seen through the Pali Puka. For more information about getting involved with 808 Cleanups, visit their website at www.808cleanups.org.